Recently, we often hear about the vulnerabilities of different mobile operating systems, and many users are seriously attended to the protection of personal data. One of the most protected in this respect smartphones today is Blackphone 2 from the company Silent Circle. Last month, the device is now available for pre-order, and now the manufacturer has officially announced the start of sales and cost of the smartphone. One of the major innovations Blackphone second generation is the ability to download content from Google Play. 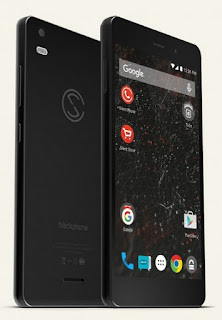 Like the previous model, Blackphone 2 running OS Silent OS, developed on the basis of Android from Google. The smartphone has a 5.5-inch display with a resolution of 1920×1080 pixels, protected by glass Gorilla Glass, an eight-core Qualcomm Snapdragon processor clocked at 1.7 GHz, 3 GB RAM, 32 GB of internal memory expandable up to 160 GB, 13-megapixel main and 5-megapixel front camera, and the battery capacity of 060 mAh with 3 fast charging function quick Charge 2.0.